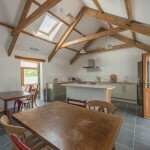 Morfa Farm bunkhouse named ‘Gwarfelin’ is a converted cow shed offering a stylish and comfortable stay. Packed with original features, the bunkhouse has been extensively refurbished to create modern, flexible accommodation for individuals, groups and events. Situated directly on the Ceredigion Coastal Path, the bunkhouse is an ideal stop off point or base for walkers, cyclists and groups exploring the area. Sleeping 18 people across three en-suite bedrooms, handmade flexible bunk beds provide rustic charm but also mean we can accommodate most kinds of bookings. 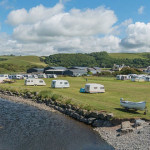 General Morfa Farm amenities are also available to those staying at the bunkhouse including; a site shop, games/snooker room, tennis court, private slipway, children’s play area and storage facilities.